Dr. Shri Thanedar, CEO of Avomeen Analytical Services is challenging the traditional system of consultative sales via innovative processes. Placing scientists at your fingertips is as close as you can get in the business of chemical analysis to touching what you are purchasing. 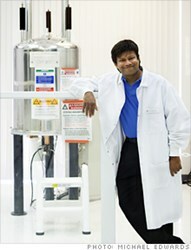 Dr. Shri Thanedar, CEO of Avomeen Analytical Services, is challenging the corporate system. His innovation is not in having sales people who might understand chemistry; his genius is employing chemists who answer calls. Offering custom consultations may not be unique to this independent research facility but how they go about it is certainly not the norm. From consulting a scientist at the very beginning to having a direct contact for the duration of your project, human interaction and expertise are always available. Compared to others in the industry this availability is a remarkably different approach. With the emphasis on people and process, Avomeen’s analytical services are fully customizable. Every project receives independent assessment and planning to ensure the projects specifications answer the client’s true questions and needs. This approach is innovative not only in that it esteems customer service above sales but that the focus has become more than either of those facets. The focus of Dr. Thanedar’s approach is truthfully the human aspect of the product. The product in reference is intellectual property combined with analysis results or developed formula. Placing scientists at your fingertips is as close as you can get in the business of chemical analysis to touching what you are purchasing. No one wants to buy something blind, and yet in the B2B world it seems all we often can do is go with the best sales pitch and customer reviews. This is what makes Avomeen’s approach so valuable. By speaking directly with Avomeen’s chemists you are assured first-hand knowledge of the processes, options, and deliverables. You know what you are getting before you begin and know it is not a pre-packaged way of doing things. Instead, you invest in true research towards personalized problem solving, and a team of chemists who intimately know your project specifics. Tests and results may seem a black and white commodity, but analysis, problem solving and customized solutions, these depends entirely on ingenuity, interpretation, and a host of other human skills. Avomeen’s approach is daring because it chooses to ignore the pre-packaged company options available in the current business world and offers something new; a revitalized and modernized form of the small town boutique, made for the corporate world of chemistry.